I run up to the other player, a giant emoji floating above my head, and wave enthusiastically. They continue stuffing enamel pots, dog food, and cutlery into their pockets, clearly preparing for some foul dinner party. Maybe they haven’t seen me? I send them a request to team up. We can join forces, complete some quests together, be a little less lonely in this broken and, at times, beautiful wasteland. The dog food chef turns to face me. I wave again. A vomit emoji appears above their head. Their character bends over, clutching their stomach, and a great green gush of vile liquid sprays out of their mouth. A message pops up on my screen to tell me they’ve rejected my party invite. 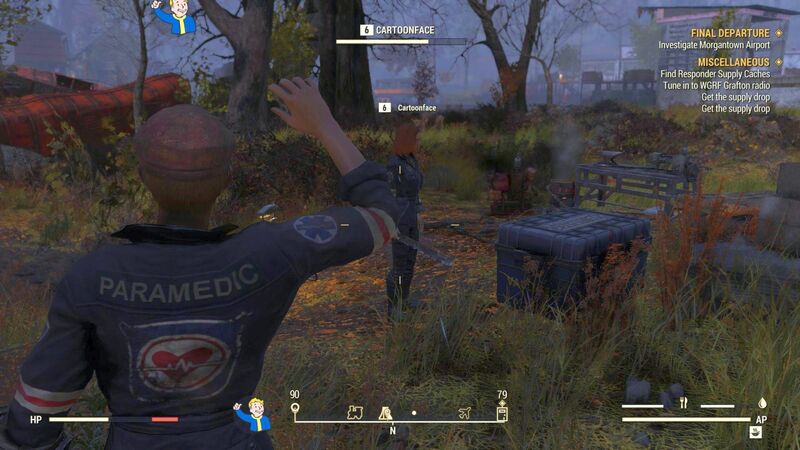 Fallout 76 is a strange multiplayer game. Largely because everyone I meet is awful. I meet a surprising number of vomiters, for starters. Then there are the people who turn and run at the sight of me, and the worst of the lot: the griefers. It’s been hours since I’ve seen another player when I come across Knuckles. Dressed in a white tracksuit and wielding a blue-tinged machete, they sprint up to me and start swinging their weapon before I finish selecting the ‘wave’ emote. Knuckles is 15 levels higher than me, so I immediately turn tail. But they chase me. I run through the grounds of a mansion, slaloming between radiation-scarred humans called the Scorched, hoping the brainless AI enemies will mob my pursuer, but Knuckles just cuts them down and stays hot on my heels. I sprint up to the building, hoping the interior will be instanced, but as soon as I load in Knuckles is already there, waiting. I exit the mansion and run to a cliff edge, praying my would-be killer will fall over the side so I can get away, but there’s nothing that will stop this irritant’s dogged pursuit. In the end I log out of the game, chastened, and a little sad. Despite all Bethesda’s talk of anti-griefing measures, the fact is that if a player is dead set on getting in your way then they’re still perfectly free to do so. Sure, killing me might put a bounty on Knuckles’ head, but that doesn’t allow gentler souls like myself to opt out of the chase. Then there are the public events which, much like the Reclamation Day celebration decorating Vault 76, are a party with no guests. These sporadically spawning events are supposed to draw players together to a location where they must fight off a larger than normal enemy force for a share in the plus-sized spoils. Events range from simple tasks like clearing out the Scorched protestors in the centre of Grafton, to more complex ones, like getting a food factory up and running and defending it from the enemies its loud machines attract. However, in my playthrough, they rarely do what they’re designed to. Often, I have to take on the task by myself. The odd time when another player does join in, and there is a glimmer of teamwork, it elevates the experience. That flicker of connection is fun in a lot of multiplayer games, but it’s undoubtedly enhanced by the wasteland setting. Two humans in a land of corpses, not only meeting, but actually cooperating. It’s just a pity it’s so rare an occurrence. As multiplayer interactions are so rare for me I’ve instead spent my time chasing down objectives in multiple storylines. I’m surprised by how many quests there are in Fallout 76 – the right side of my screen is constantly populated with things to do. The main storyline has you following in the footsteps of Vault 76’s overseer, who was the first out into the harsh wasteland. Wherever you go, she’s one step ahead, leaving behind audio diaries and notes of who needs help in the region. But I often also find myself stumbling into stories. One quest, for instance, begins when I discover a body in the basement of the Charlestown Council Chambers. Nestled in the woman’s pockets is a garbled tape that leads me to a mansion in the hills above the town. The building hides a secret bunker for an organisation of crime fighters. I can join up and take part in their initiation before heading out into the world to finish what they started. 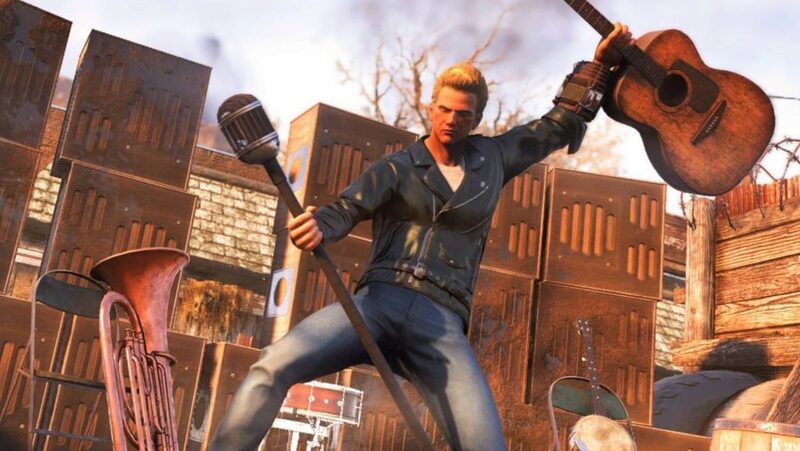 Fallout 76 is not a full-blooded Fallout sequel; Bethesda has been clear since the game was first shown at E3 that it would not feature any living NPCs. Instead, the only semi-sentient quest givers are the robots dotted about the wasteland. These machines stand in their spot or walk in circles, talking in looped barks – both guardians of a dead world and caretakers waiting for a new one to grow. It makes for an intensely lonely landscape, but also takes away some of the possibility of surprise. Many of the quests are about following in someone’s footsteps, or begin framed in the manner of ‘Go meet this person here’. Yet you know from the off that all that’s waiting for you at the end of the questline is another corpse. In my first days with Fallout 76 these quests were entertaining. I thought of them as being as good as those in previous Bethesda Fallout games, often filled with lively writing and dark jokes. However, the more I play, the less engaging they become. One reason for that is down to playing in a shared world, which means nothing I do can have an impact on the environment. There isn’t a Megaton I can choose to spare or sacrifice. Everything must stay static in this game – at least until Bethesda decide to inflict change on the servers. Without a sense of change, these quests become filler, which isn’t in the spirit of the Fallout series. It doesn’t help West Virginia feel any more lived in that the AI enemies do such a poor job of appearing alive. They’re clearly just waiting around for you to turn up and kill them. 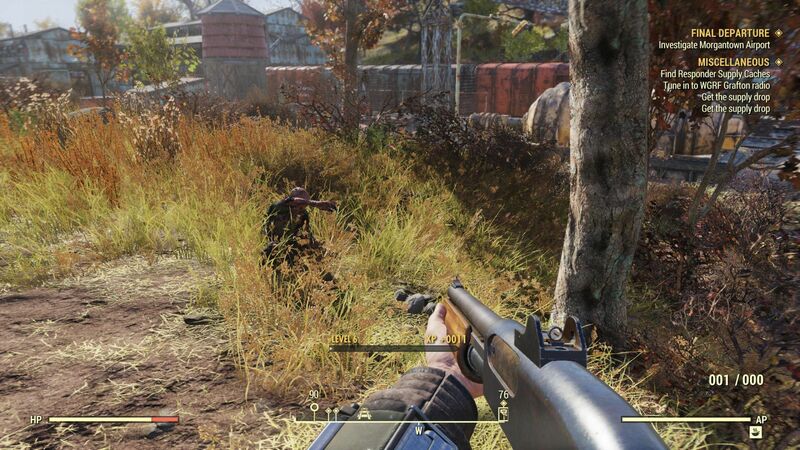 When Scorched and ghouls aren’t spawning out of thin air, I’ve sat hidden watching them to see how they spend their time and, well, they just stand there, fixed to the same spot. After 30 hours of fighting countless Super Mutants, Scorched, and ghouls – who all behave exactly the same way, suffer from the same bugs, and offer no real challenge – I am completely bored of combat. Now, when I see an enemy, I’m just frustrated that they’re getting in the way. There’s no fun in the 500th headshot against these cretinous creatures. Loot has been a central part of all of Bethesda’s RPGs since Morrowind – if an item’s not nailed down then you can stuff it into your pockets. In earlier games, if I didn’t want to become encumbered, I had to learn to suppress my urge to steal everything, and only pick up the items I actually needed. With the introduction of settlements and modifications in Fallout 4, however, junk items gained purpose. You could break down anything you didn’t need into its constituent parts and use those resources to build a base, craft weapons and armour, or repair your gear. That holds true in Fallout 76, too, but it leads to a series of problems. Fundamentally, the issue is that every item is useful and worth picking up. Which means I frequently become encumbered. I’ve spent most of my 30 hours with the game forced to walk slowly because my character can no longer run and is too tired to jog. The solution is either to stop picking up items or to fast-travel back to my camp to offload all this equipment. Neither of those are great options as this junk is vital. If I don’t pick up a wide spread of items I won’t have the adhesives necessary to repair my guns, the wood I need to boil my dirty water, or the steel I need to build defense turrets for my base. Any time I try to play frugally I find myself short of one necessary resource for building or repairing gear and I suffer as a result. While you can take a gun from any number of dead enemies, none of them will be as good as the one I’ve spent resources and time upgrading. I’ve gone hours without my weapons because I’m short of the superglue I need to repair it. Worse, while fast-travelling to camp is free, returning to where you left isn’t. 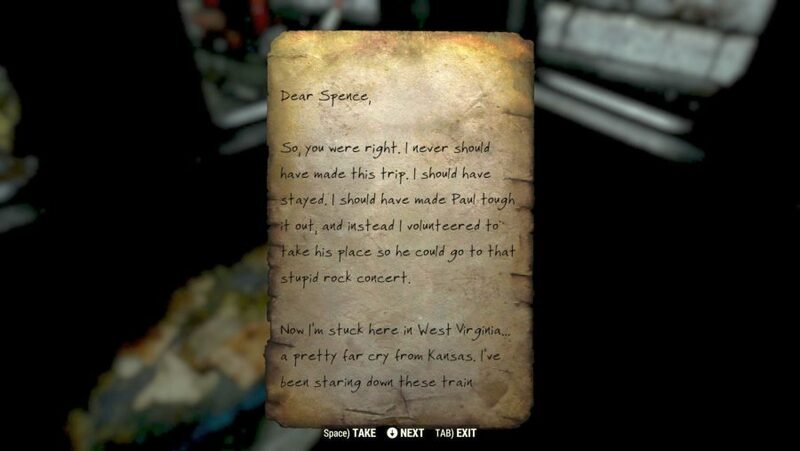 You have to spend caps to teleport around West Virginia, the journey costing more the further you go. You could always uproot and replace your camp nearer to where you are but that, too, costs caps. And, because you can’t fast-travel if you’re encumbered, as soon as you go over your weight limit you have to make a call: do you quit your adventure to drop off your loot back at camp, or continue on knowing there will be a very long walk back afterwards. One workaround is to use the multiplayer systems. As it’s free to fast-travel to a party member’s location, you can give your excess loot to a friend, fast-travel to camp, dump your loot, and then fast-travel back to your buddy. They’ll then give you their loot and do the same. This can be a multi-stage process if you’re both way over the weight limit, and feels like working around a problem in the system, rather than the solution Bethesda intended. Then you run into the issue of your stash limit. In Fallout 76, the maximum amount of loot you can store is 400wt. I hit that limit before I reached level 20. Between my set of power armour, the weapons I’m holding onto until I’m at a high enough level, the ammunition, and the resources I have stashed, I’ve run out of space. I think this all speaks to a more pressing issue: a significant disparity between the ways to gain and spend different resources. 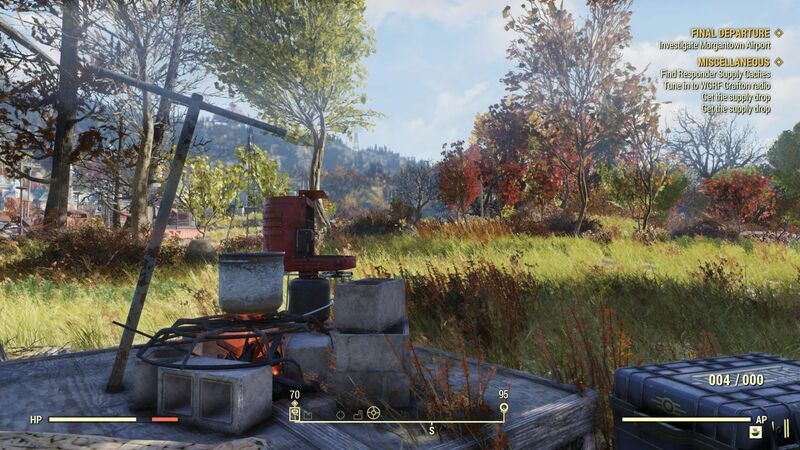 Fallout 76’s economy isn’t balanced. I’m forever short of certain essential resources – mainly the adhesives needed for repairing weapons – while I’m overloaded with other materials I don’t know if I need. If there were more opportunities to spend all this junk then my inventory and stash could be more active, with resources flushing out into the world instead of sitting stagnant – in the case of food, literally spoiling in my pockets. 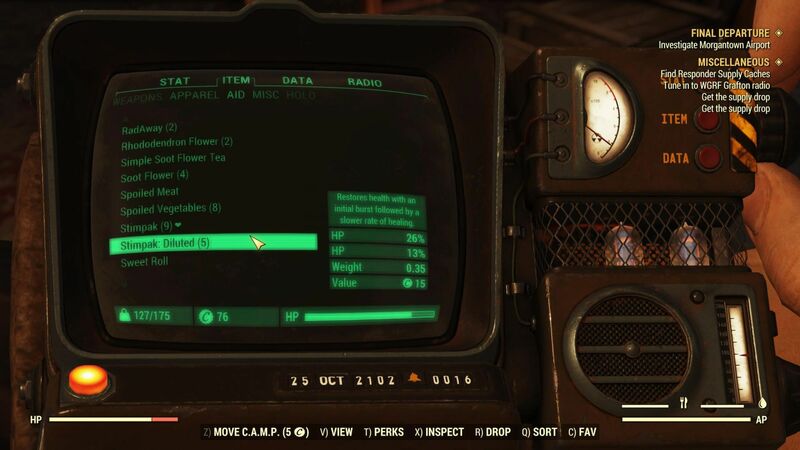 For a game that demands you spend so much time in its menus, Fallout 76’s UI is terrible. Whenever you need to use an item you have to first open your Pip-Boy, go to your inventory, open the correct submenu, find the item in an alphabetised list, select and then choose to use it. All of which you may need to do in the heat of a battle. This was true of Fallout 4, too, but while in that game it grounded you in the world, when you’re in your Pip-Boy in Fallout 76 you’re vulnerable to attack from wildlife and other players. You can favourite items, adding them to a radial menu you can bring up by scrolling the mouse wheel, but I’ve filled that with weapons alone, which means I basically never use the stims and chems I’m picking up as I explore. There’s a perk that makes you automatically use a stimpack when your health falls below 20%, but that feels very much like creating a mechanic to get around a more deep-rooted problem. Worse still is when you’re back at camp and have to hop between multiple crafting benches, where you can’t perform all the associated actions on one screen. For instance, you might need to go to the armour bench and swap between different submenus to scrap, repair, modify, or craft armour. This might seem like a small gripe but I’m finding it unnecessarily fiddly, particularly in a game where you can’t pause and are vulnerable every time you enter a menu. This is all exacerbated by some menus being exited with the ‘escape’ key, while others need to be tabbed back out of. In time, everything about Fallout 76 becomes tired, frustrating, and clunky. When I log in to play it feels like I’m about to do a chore. When I first stepped into the world I became invested in the quests, I was taken aback by some of the beautiful vistas, and I loved piecing together the story of the destroyed scenes I stumbled into. But the more I continue the harder it is to hold onto those memories, since the world loses more of its lustre with every additional hour I spend in it. 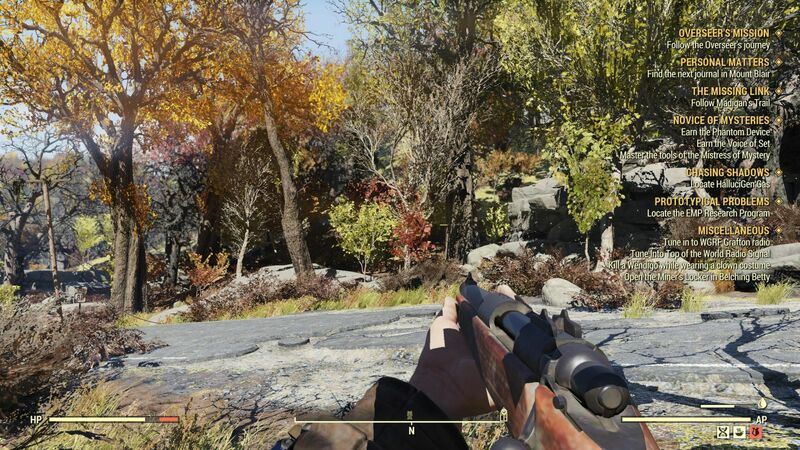 This is both because the limits of Fallout 76’s variety become more obvious – in quest design, set dressing, and enemy encounters – and because the systems I have to spend so much of time engaging with are so arduous to use. I find it’s easiest to think of Fallout 76 as a stage. The world, unchangeable, is a set. The robots and AI enemies are silent extras to fill out the scene. It’s just waiting for players to be actors, and for stories to spin out from their interactions. Without them, you can just see the artifice and inelegance of Fallout 76. Of course, when they do eventually turn up, they just vomit on everything. Fallout 76 isn’t to be compared with other Fallouts - it’s a spin-off that wants to be something new. Unfortunately, the multiplayer sandbox it tries to be is stagnant and intensely frustrating to play.